The human body has a normal temperature of 98.6° F. But sometimes the body temperature increases for various reasons. And when this happens, we say that the person has a fever. Medically speaking, fever is not an ailment in itself – it is a direct symptom that some other illness is there in the body. Having fever means that the body is trying to fight the infection in its own way. However, if the body temperature rises very high, it might cause damage and thus steps should be taken to keep it under control. Fever might be accompanied by chills, sweating, headache, weakness, overall pain in the body and complete loss of appetite. Basil has been used as a medicine in India since prehistoric times. The herb is as effective as some of the strongest antibiotics on the market. It has amazing healing properties and can bring down body temperature by great means. Take 20 basil leaves and crushed ginger about 1 teaspoon and boil the same in 1 cup of water. Keep on boiling till the solution reduces to half. Add a little honey and drink the solution 2-3 times a day for 3 days. Use of cool water for bringing down body temperature is not new. Take a wash cloth and soak the same in cool water. Wring off excess water and sponge the hands, groin area, armpits and forehead to bring the temperature down. Apart from this, damp, cold washcloths can be placed on the forehead as well as at the back of the neck. In case of high fever, the washcloths become warm after some time. Change them. Using very cold water is not recommended – cool tap water is best. High fever can be lowered with garlic as it has the capability of promoting sweating. Garlic has anti bacterial and anti fungal properties, which help in combating infections in the body and keeps diseases at bay. The process of recovery is accelerated as garlic flushes out toxins from the body. Take 2 tablespoons of olive oil and add 2 crushed garlic cloves to it and warm the same. This mixture has to be applied on both foot soles. Wrap the feet with a piece of gauze so that the garlic remains in place. Let it be like that for a night. Your fever will be gone the next day. Do not apply this on small kids and pregnant women. Vinegar is used in many herbal medicines. Take a potato and slice the same. 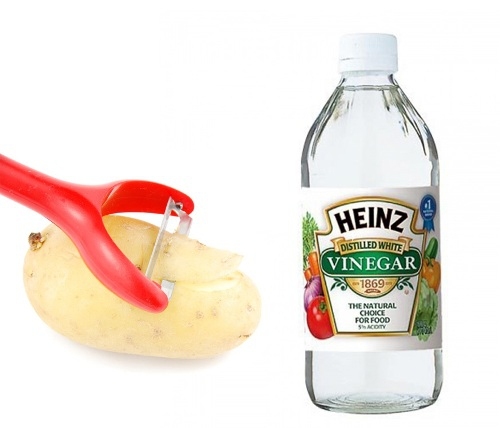 Take some vinegar and soak the sliced potatoes in the same for about 10 minutes or so. Lie down and place the vinegar soaked pieces of potatoes on the forehead. On this, place a washcloth and let it be like that. In about 20 minutes, you will see the temperature coming down gradually. Mint is well known for its cooling properties. Taking mint while suffering from fever will help in cooling the internal system of the body, thus reducing body temperature. The excess heat from the body is extracted by this natural ingredient effectively. Take a cup of hot water and add about a tablespoon of crushed mint leaves in the same. Let it steep for a few minutes. After straining, add some honey to the mixture. Drink the solution 3-4 times a day for fast recovery. Turmeric has great effects on reducing fever. Turmeric has curcumin, which is rich in antibacterial, antifungal, antiviral and antioxidant properties. It provides immune system the strength to fight any kind of infection and reduces fever fast. Take a cup of hot milk and add ½ teaspoon of turmeric and ¼ teaspoon black pepper. Drink this mixture twice daily for best results.